When temperatures rise, your body perspires more, and that includes your feet. While you can don shorts or tank tops to beat the heat, many of us must wear closed-toe footwear such as sneakers, cleats or dress shoes in the warm-weather months. 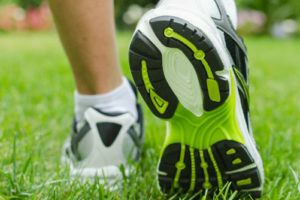 Closed-toe shoes plus hot weather equals foot odor – or even infections such as athlete’s foot. Foot odor and infections happen when the bacteria that live on your skin and in your shoes eat your sweat. This produces an acid byproduct that smells unpleasant, says podiatrist Joy Rowland, DPM. “Bacteria and fungi and all those lovely little bugs love heat, moisture and darkness — and the inside of your shoes is the best place for that to happen,” Dr. Rowland says. Thoroughly cleaning your feet is more than rinsing them with a quick shower. Dr. Rowland recommends soaking your feet in a mixture of vinegar and water or Epsom salts and water. For a salt soak, dissolve half a cup of Epsom salt in a tub or large bowl of warm water and soak for about 10 to 20 minutes. Epsom salt pulls moisture out of your skin, which in turn makes a less-inviting place for bacteria to survive. For a vinegar soak, combine two parts water with one part vinegar in a tub or large bowl of warm water and soak for 15 to 20 minutes once a week. You can use either white or apple cider vinegar. Vinegar makes your skin inhospitable to bacteria. One note of caution: do not use this soak if your feet have open sores, scratches or cuts or if the soak irritates your skin. If you prefer the shower, it’s important to wash your feet thoroughly using a wash cloth and be sure to scrub between the toes. Whatever method you choose, be sure to dry your feet well after bathing, soaking or swimming. Unpleasant odor comes from moisture, so it’s important to keep feet, shoes and socks as dry as possible, Dr. Rowland says. If your feet get sweaty as the day goes on, put an extra pair of socks in your gym bag or briefcase and change your socks at lunchtime or after your workout. You also can help keep your feet dry by choosing socks made of cotton, and shoes made of natural materials such as cotton or leather. These natural materials allow the moisture on your feet to evaporate. Man-made materials such as nylon or plastic trap moisture. Are your shoes surrounded by a green cloud of odor even when you’re not wearing them? You don’t have to throw them away. A general-purpose disinfectant spray like the kind you use in your kitchen can take care of that nasty smell coming from your kicks. Look for a kitchen spray that contains ethanol and other sanitizing ingredients, which kill the bacteria. “Take the insole out of the shoe, lightly spray the insole, and let it dry for 24 hours. Then when you put the insole back in the shoe, you’ve treated the shoe,” Dr. Rowland says. If you notice that your feet sweat, you could try an over-the-counter foot antiperspirant. Or go the home-remedy route and sprinkle a little corn starch into your shoe to keep your feet dry. “You can even use just a regular underarm antiperspirant — that will definitely help to control the moisture,” Dr. Rowland says. If it’s time to call in the big guns, ask your doctor for a prescription medication designed to treat foot moisture problems.